Liverpool striker Mohamed Salah will not feature in the international friendly between the Super Eagles and Egypt scheduled to take place at Stephen Keshi Stadium, Asaba on March 26. According to Kingfut, the leadership of the Egyptian Football Association decided to give the African Footballer of the Year a rest and he will not be summoned for the games in March against Nigeria and Niger. The most successful side in Africa Cup of Nations history are already through to this summer's AFCON ahead of their dead rubber qualifier with Niger on March 22. ''Mohamed Salah will not play the Niger game in the AFCON qualifiers or the Nigeria friendly,'' EFA Vice President Ahmed Shobier stated. 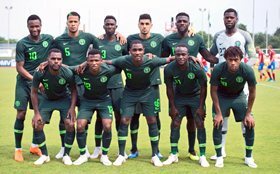 The last time the Pharaohs visited Nigeria was for an AFCON qualifier on March 25, 2016 which ended in a 1-1 draw, with Salah netting an injury-time equaliser for the North Africans.